The Center Digitization.Bavaria (ZD.B) takes part in the Intersolar Europe 2019 as a sub-exhibitor of Bayern Innovativ. The ZD.B will present its platform “Digitization in the Energy Sector” and the EU project EASY-RES. We look forward to discussing the Bavarian and European energy future together with you. The fair trade offers visitors a comprehensive overview of trends, technologies and innovative concepts for the new energy world. About thousand providers in the field of products and solutions for photovoltaics, solar thermal technologies and solar power plants, grid infrastructure and solutions for the integration of renewable energy will be exhibiting at the trade fair. The ZD.B thematic platform “Digitization in the Energy Sector" addresses all areas of the digital energy transition. In particular the use of digital technology to manage network congestion problems, the efficient network reinforcement, the regional use of flexibility, energy efficiency, integrated energy management, the integration of renewable energies and the mobility- and heating transformation. Our goal: Promoting Bavaria’s energy future through digitization in a sustainable way. EASY-RES is a European research project of the thematic platform in cooperation with 11 partners in 6 EU countries. We develop novel control algorithms and innovative ancillary services, which will allow the penetration of up to 100% of renewable energy sources in the European energy system. 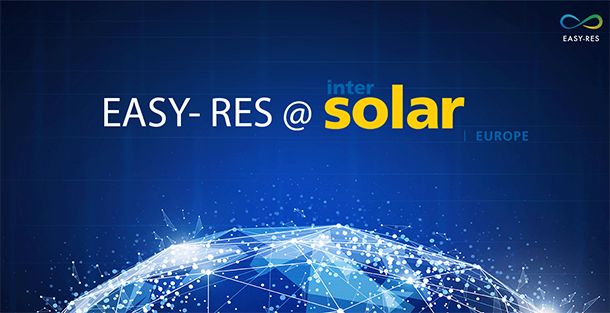 Meet our experts @ Intersolar Europe 2019 and exchange knowledge, ideas and thoughts about the digitization of the energy industry and a sustainable energy future. We have a limited contingent of free tickets (regular price: 25€ / 35€) for interested people, who want to get in touch with EASY-RES and Center Digitization.Bavaria. If you are interested in one of the free tickets, you are welcome to contact us. The ticket is valid for all The smarter E Europe exhibitions 2019 (Intersolar Europe, ees Europe, Power2Drive Europe, EM-Power). We are looking forward to meet you @ Intersolar Europe 2019.